Prime Minister-designate Benjamin Netanyahu is considering the appointment of Avigdor Lieberman as foreign minister, news sources say. 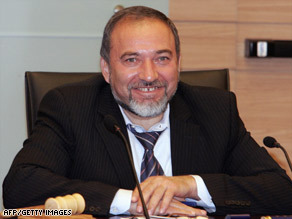 Lieberman ran for Prime Minister against Netanyahu and several others and is considered an essential part of the new coalition government in Isreal. Lieberman’s party, Beiteinu, will be the second largest faction in the new coalition government behind Likud, which is headed by Netanyahu. Lieberman keeps a hard line attitude that is strictly pro-Israel. His appointment may be a setback for peace talks with Hamas, Hezbollah and others in the region, most Middle East analysts believe. But Lieberman would be expected to improve ties with Russia; which may directly assist American President Barack Obama’s efforts to gain Russian cooperation in ending Iran’s nuclear program. Netanyahu has come to believe that Iran poses the biggest threat to israel, with its nuclear program and its funding and supply train to Hamas and Hezbollah. Lieberman’s ties to Russia could help Israel and the U.S. and open a door toward new relations. Lieberman was born in Moldova, then a part of the Soviet Union. His rough and tumble political style and attitudes reflects his previous work as a bouncer in a bar. He would be a highly unusual pick for Israel’s top diplomat, but would reflect the sharp turn to the right in Israeli politics where Iran and its nuclear potential are feared. Many Israeli’s also now have the belief that they are under seige on all sides by their neighbors. You are currently browsing the archives for the Lieberman category.